It was a rare opportunity to shake hands with one of Washington’s most influential women. On March 7, Dr. Jill Biden, Second Lady of the United States and full-time English professor at a community college in northern Virginia, took a tour of campus, met with students and faculty, and talked with Vice Chancellor Al Bloom about trends in higher education. Students and professors also showed off some of their recent projects, including an award-winning drone, and smartphone app designed for safer driving. Biden’s campus tour was part of a multi-day visit to the region. With the recent acts of violence against Charlie Hebdo, writers’ and artists’ freedom of expression, pertaining to political correctness, is once again being called into question. This controversy can result in a set of questions: Does an offensive or disrespectful portrayal of the Prophet Mohammed in a satirical cartoon realize or betray American and European values of pluralism and multiculturalism? How do we defend the freedom of secular-artistic expression against other peoples’ religiously-motivated fundamental rejection of such satire? How do we show respect towards those individuals who do not necessarily take part in or support the secular culture of their own country? How can we successfully integrate two fundamental pillars of transatlantic societies – respect for religious belief/practice and free expression of ideas – to create the open and pluralistic communities towards which we as Europeans and Americans have been striving for centuries? On March 30, NYU Washington, DC and the European Union National Institutes of Culture will welcome acclaimed writer, and Writer in Residence at the Arthur L. Carter Journalism Institute at NYU, Salman Rushdie for a reading of an except of his most current book, Two Years Eight Months and Twenty-Eight Nights, followed by a discussion on the role of satire in the public sphere. Salman Rushdie is the author of twelve novels: Grimus, Midnight’s Children (which was awarded the Booker Prize in 1981), Shame, The Satanic Verses, Haroun and the Sea of Stories, The Moor’s Last Sigh, The Ground Beneath Her Feet, Fury, Shalimar the Clown and The Enchantress of Florence, and Luka and the Fire of Life. His most recent novel, Two Years Eight Months and Twenty-Eight Nights, was published simultaneously around the world in the English language in September 2015. He is also the author of a book of stories, East, West, and four works of non-fiction – Joseph Anton – A Memoir, Imaginary Homelands, The Jaguar Smile, and Step Across This Line. He is the co-editor of Mirrorwork, an anthology of contemporary Indian writing, and of the 2008 Best American Short Storiesanthology. He has adapted Midnight’s Children for the stage. It was performed in London and New York by the Royal Shakespeare Company. In 2004, an opera based upon Haroun and the Sea of Stories was premiered by the New York City Opera at Lincoln Center. A Fellow of the British Royal Society of Literature, Salman Rushdie has received, among other honours, the Whitbread Prize for Best Novel (twice), the Writers’ Guild Award, the James Tait Black Prize, the European Union’s Aristeion Prize for Literature, Author of the Year Prizes in both Britain and Germany, the French Prix du Meilleur Livre Étranger, the Budapest Grand Prize for Literature, the Premio Grinzane Cavour in Italy, the Crossword Book Award in India, the Austrian State Prize for European Literature, the London International Writers’ Award, the James Joyce award of University College Dublin, the St Louis Literary Prize, the Carl Sandburg Prize of the Chicago Public Library, and a U.S. National Arts Award. He holds honorary doctorates and fellowships at six European and six American universities, is an Honorary Professor in the Humanities at M.I.T, and University Distinguished Professor at Emory University. He has received the Freedom of the City in Mexico City, Strasbourg and El Paso, and the Edgerton Prize of the American Civil Liberties Union. He holds the rank of Commandeur in the Ordre des Arts et des Lettres – France’s highest artistic honour. Between 2004 and 2006 he served as President of PEN American Center and for ten years served as the Chairman of the PEN World Voices International Literary Festival, which he helped to create. In June 2007 he received a Knighthood in the Queen’s Birthday Honours. In 2008 he became a member of the American Academy of Arts and Letters and was named a Library Lion of the New York Public Library. In addition, Midnight’s Children was named the Best of the Booker – the best winner in the award’s 40 year history – by a public vote. His books have been translated into over forty languages. A film of Midnight’s Children, directed by Deepa Mehta, was released in 2012. The Ground Beneath Her Feet, in which the Orpheus myth winds through a story set in the world of rock music, was turned into a song by U2 with lyrics by Salman Rushdie. Leading scholars and thinkers in different disciplines from around the world met over three days from March 13-15 at NYU Shanghai to explore the global perspectives and legacies of the 1960s. The conference, titled “Revisiting 1968 and the Global Sixties” is sponsored by the NYU Provost’s Global Research Initiatives and the Office of the Provost of NYU Shanghai. The conference will reconvene in Abu Dhabi and then New York later in the year. Because existing scholarship tends to concentrate on the Sixties in the U.S. and Western Europe, the initiative is focusing on Asia, Africa, the Middle East and Eastern Europe. “I am particularly glad to see that both NYU Shanghai faculty colleagues and students attended the conference. This is most exciting and most encouraging”, said Chen Jian, NYU Distinguished Global Professor of History at NYU Shanghai, commenting on the participation of younger professors and graduate students from inside and outside the global network. The 20th century, according to Chen Jian, was probably the most transformative time in human history. Few decades or years had stood more outstandingly than the long 1960s — especially the year 1968 — in shaping and reshaping the world in political, geostrategic, economic, social and cultural senses. 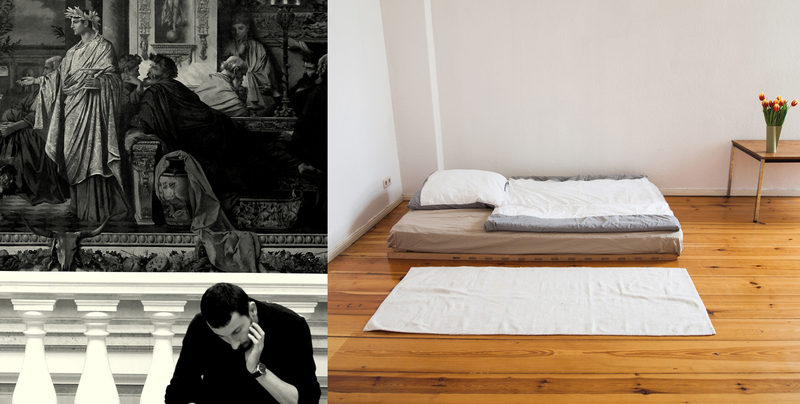 NYU Berlin, Universität der Künste Berlin, and Deutsches Haus at NYU present the fifth annual student group exhibition at Deutsches Haus, reflecting students’ transcultural experiences. From Tuesday, March 22 – Saturday, April 23, The Guest as Host exhibtion will be at the Duetsches Haus NYU, 42 Washington Mews, New York. The Guest as Host showcases work by students from NYU Berlin and Universität der Künste Berlin. Participating students include: Sabrina Labis & Dovile Aleksaite, Andrea Mikyskova, Daniela De Costanzo, Gina Maskell, Katherine Merrow, Sarah Steinhart, Beatrix Walter, Emily Wang & Hamda Salah, and Benjamin David Wolf. As part of this project, the exhibition jury will award the “NYU Berlin Culture Brewery Prize 2016,” which will reward the winner(s) with $1,000 intended for a trip to Berlin or New York. The exhibition is curated by Nina Fischer, Professor for experimental film at UdK, and Christina Dimitriadis, Professor for contemporary art & photography at NYU Berlin. For exceptional teaching inside and outside of the classroom setting, NYU Shanghai Associate Arts Professor and Director of IMA, Marianne Petit, is being honored with this year’s Distinguished Teaching Award. Established in 1987, the award has highlighted New York University’s commitment to teaching excellence and is given annually to selected outstanding members of the faculty. “I am delighted that Marianne has won NYU’s Distinguished Teaching Award, which is awarded to only the very best of NYU’s many fine teachers. She is an inspiration to her students and to us all, and richly deserves this recognition,” said Provost for NYU Shanghai and Julius Silver Professor of History Joanna Waley-Cohen. Nominated by students, faculty and alumni, recipients of this honor are presented with a medal and a monetary award in recognition of their significant contributions to the intellectual life of the University through their excellence as educators over a sustained period of time. Recipients must have the ability to inspire, promote, and sustain the intellectual development of students with a pedagogical approach that is innovative, intellectually rigorous, creative and engaging. “I’ve had the pleasure of working alongside Professor Petit for 15 years in New York and Shanghai, and I realized that too few people know what an extraordinary teacher and mentor she is. I was delighted to learn that the University is recognizing her extraordinary contributions. As anyone who has worked with her can tell you, she is one of NYU’s treasures, and this award is richly deserved,” said Associate Professor of IMA Clay Shirky. 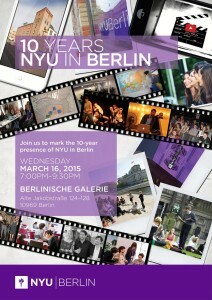 NYU Berlin Celebrates Ten Year Anniversary! 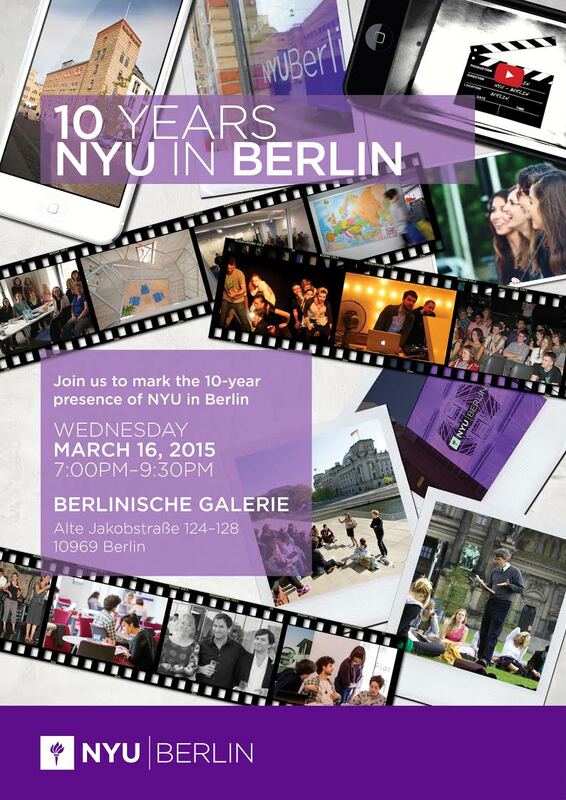 On March 16, NYU Berlin will celebrate ten years of vibrant academic and cultural activities in the German capital! On 17 March, NYU Washington, DC will host an event, Destruction as Image-Act: Remapping History, as part of its Iconoclash program. Propaganda and imagery are integral to terrorism. Their production by Da’esh in the last three years has achieved a competitive quality and displays bewildering resilience to counter terrorist measures. The digital media made available to audiences globally demonstrate a new dimension of immediacy of crime and ostentation. Videos of trials, beheadings, fighting and destruction have borrowed formats from formats such as video games and documentary films. The execution of people and the destruction of cultural objects and places have been used to produce a self-righteous culture of annihilation and implement an overall claim to a lasting change of the course of history in the Middle East and beyond. Friday, February 26 was Global Service Day and NYU Accra students and staff joined the children of La Enobal Basic School and New Horizon Special School to celebrate it. 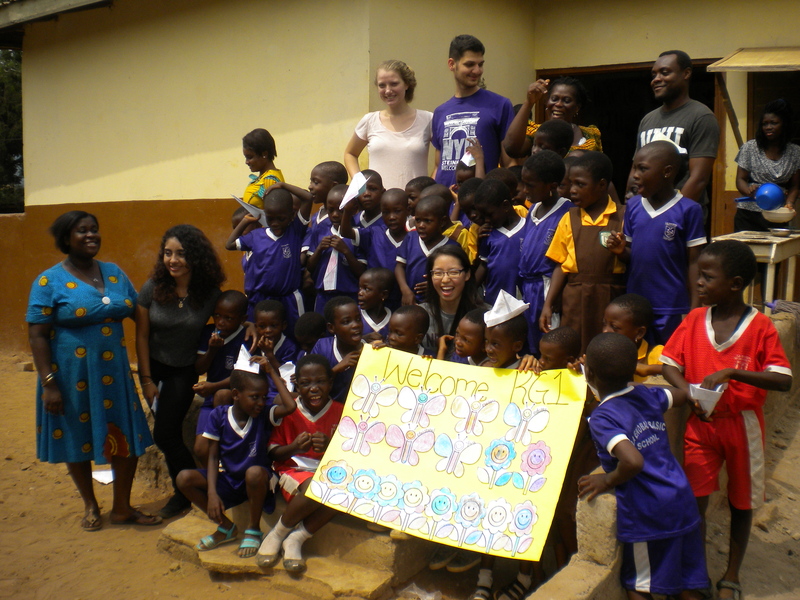 Starting at 8:00am, NYU Accra students went to both of these schools carrying boxes filled with printed sheets, pencils, crayons, drawing sheets, etc. La Enobal Basic School caters to children of low-income parents, many of whom serve as drivers, caretakers, housekeepers, babysitters, etc. for occupants of middle-income homes in the North Labone area. The choice of the school for the service day was therefore motivated by need. On arrival at the school, the teachers and children enthusiastically welcomed the students. Soon the students went to their assigned classes and engaged the children in various activities, including storytelling, English language lessons, spelling drills, drawing, coloring, and singing. 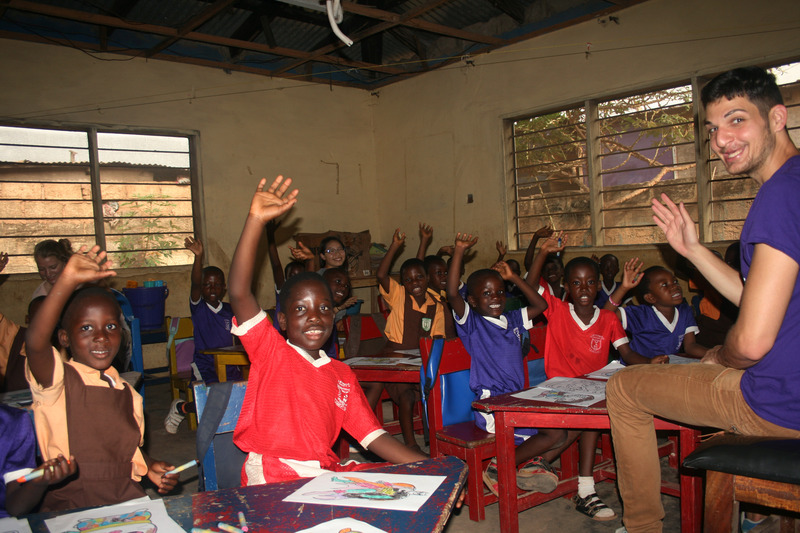 The classroom activities lasted two hours followed by 30 minutes of outdoor activities and games and group pictures. 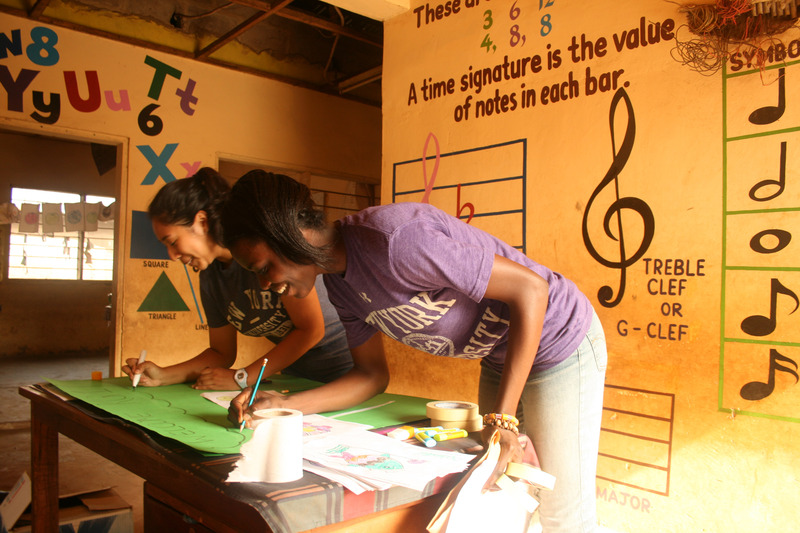 Whilst the students and staff at La Enobal mainly taught the school children and played with them, the staff and students at New Horizon worked on a project to decorate the classrooms for the students. As you can see from the photos, it was a memorable and meaningful experience for all. Digital street portraiture — There is an app for that, thanks to enterprising undergraduates at NYU Shanghai. Inspired by Humans of New York (a blog gone viral on Facebook and Instagram), Musa Malik, a neuroscience major, teamed up with computer science major Alexandru Grigoras and computer science professor Keith Ross, creating a new mobile app called humans — the first global album of digital street portraiture. 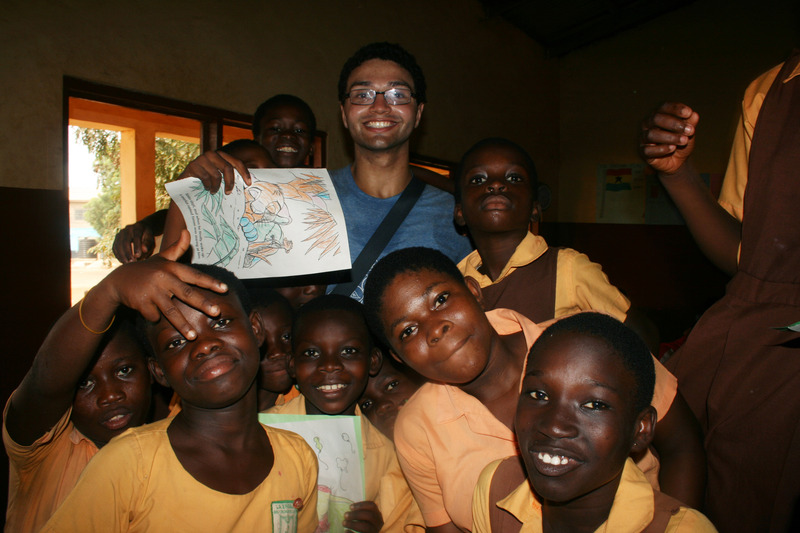 “Humans provides a unique perspective into the daily lives of people from the entire globe, bringing to light to stories of struggle, inspiration, and joy,” said Malik who originally conceived the idea and is now actively promoting the app. After discussing the project together, Professor Ross helped Malik team up with Grigoras, who developed the entire app on his own and single-handedly wrote every line of code over a span of nine months. A beta android version was released late summer of 2015, and now the app is available for android, iphone and also has a browser interface. “This is by far the largest and most exciting software project I have been involved with to date,” said Grigoras. You can already find over 1,000 stories from over 30 different countries now on humans. Users can browse by country, by artist (contributor), by top stories, by recent stories, by featured stories, and by story themes. You can interact by giving a ‘thumbs up’ or by assigning a specific emotion to a story. Currently the top contributor is Tehreem Nihar, a second year NYU Shanghai neuroscience major. Her posts breathe life into portraits of people from Pakistan, from the streets of Shanghai, and even feature stories of NYU students and faculty. “I’ve had an amazing experience interviewing and taking portraits of people so far. I am glad to be part of this project and to have had meaningful interactions with interesting people asking them to share something personal, because everyone has some something different to share,” said Nihar. In addition, many other NYU Shanghai students have already started posting stories to humans, including Anna Jaskiewicz, sharing stories of China and Poland, and Diem Hang Pham shedding light on lives from Thailand and Hungary. “I am very proud that our NYU Shanghai students have developed such an exciting application, and also have contributed so many compelling stories,” said Professor Ross. The humans project is already gaining momentum on the web, featured in Buzzfeed’s “16 Things You Should do in 2016” and “The Love Around Us,” and NYU Shanghai’s independent student newspaper On Century Ave. Musa Malik goes in depth about the Humans project “aim[ing to] promoting cultural amalgamation and tolerance amongst global communities in this interview. Experience and download the app here. 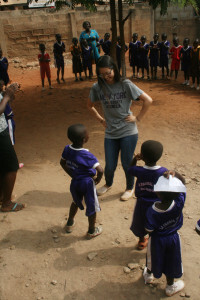 See more on this story from NYU Shanghai here.